Last week we lost our beloved Hector. 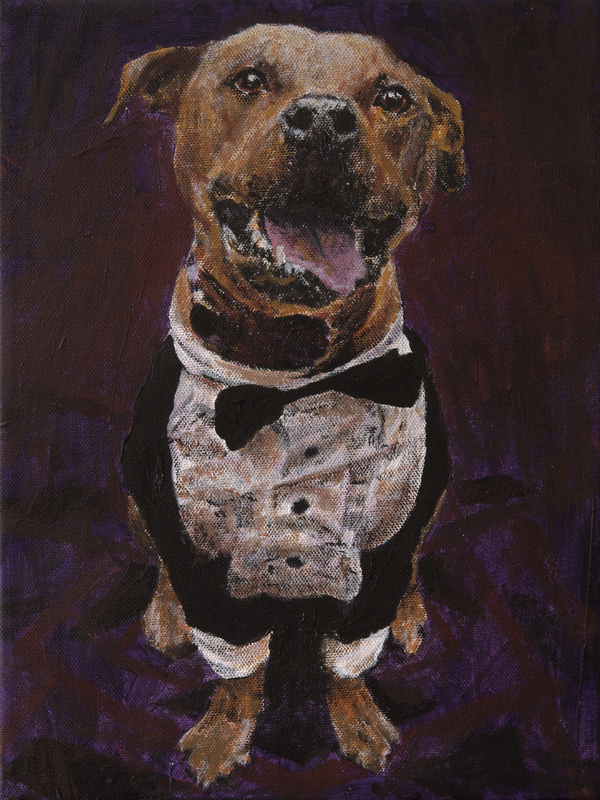 While thinking about him and trying to commit every little detail to my memory forever, I realized he is my Most Painted Dog, my goofy-faced muse. For those who don’t know of him, his claim to fame was starting his life with NFL player Michael Vick as a fighting dog. Hector quickly proved to be much more than a scarred pit bull with a traumatic past. His sparkling charm and dog-friendly nature brought him to us via BADRAP. No rehabilitation necessary, he sailed through the CGC, therapy dog, and temperament tests and made his way into the spotlight, loving every second of it. But really, he was a regular dog. What was so remarkable about him was how unremarkable he was. That is not a slam on Hector. That is a glowing recommendation of all dogs and their individuality. What seemed so special about Hector was that he could come from a horrible situation and be such a regular amazing dog. 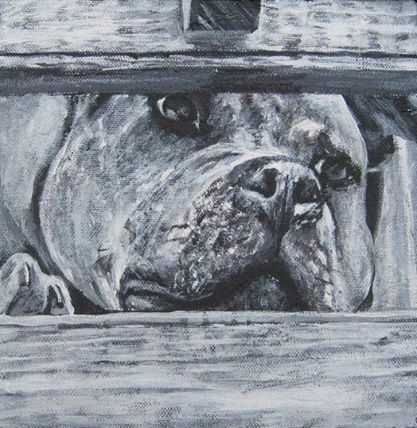 I guess Hector inspired me to give art to organizations that helped dogs like him. And my first painting ever was of him. 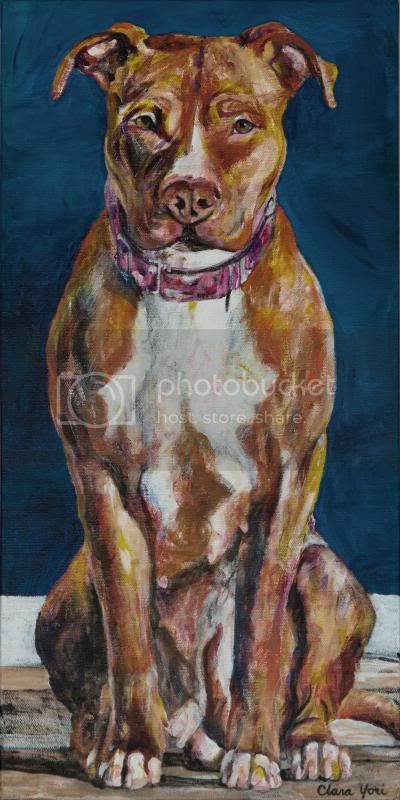 Pinups for Pit Bulls was having an art auction and I thought, “Oh that’s right. I may have some artistic ability lingering somewhere. I don’t paint, but I am going to donate a painting anyway and it will be Hector.” I don’t know what that was about, but I made up my mind and did it. And along the way it turned into a full time job. Thanks, Hector. My first painting. 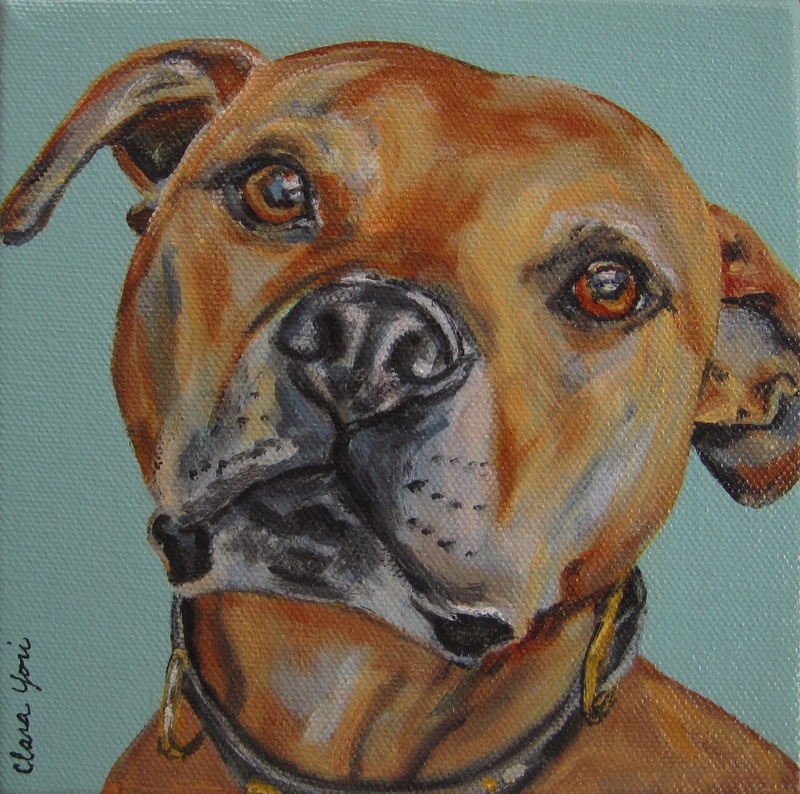 Donated to Pinups for Pit Bulls. I loved the goofy grin on his face and had to paint it. Donated to A Rotta Love Plus. Another dorky face to paint. This one is big and it’s all mine! Always up for anything, Hector endured our goofiness, too. This one went to Camp Companion. This was a little painting donated to A Rotta Love Plus. The night after he died came the worst feeling ever. We came home after The Appointment and I could still feel him everywhere. I looked at the hallway at the base of the stairs and thought, “He was just sitting right there this morning”, upstairs in the dog bed in my studio, “He was right there this morning curled up with Mindy Lou”, by the front door, “He was wagging his tail here when we left to go to his Appointment”. Those are the kinds of things I think about initially, but gradually the dark thoughts morph into the happy memories…The way he pounced on toys, stole toys from the other dogs, loved sunshine more than anything, tricked us into one part of the yard so he could go eat poop in another part of the yard, remained his constant go-with-the-flow self in any kind of public situation (way more than I ever could), let Mindy gnaw on his face, buddied up with Angus and Scooby, cuddled with me occasionally after he got sick, obsessed over frogs and underwater things, refused to do out-and-back walks (loops only! ), went bananas when I put essential oils on him, and ALWAYS backed up the other dogs when they barked at something (I guarantee he was clueless as to what the commotion was about, but he was glad to contribute to it). I know other qualities and memories about him will come back at random times just like when I suddenly remember Ajax pulling at my leg inviting me to play or when it’s feeding time and I think of Wallace wailing like he hasn’t eaten in a decade. I love those moments when a memory unexpectedly floods me. I look forward to smiling at my Hector memories. It was an honor to be one of Hector’s people. He made me better. He made the world better. I am pleased to announce that I have been chosen as the featured artist for this year’s Deviant Art – Dispelling Myths event. 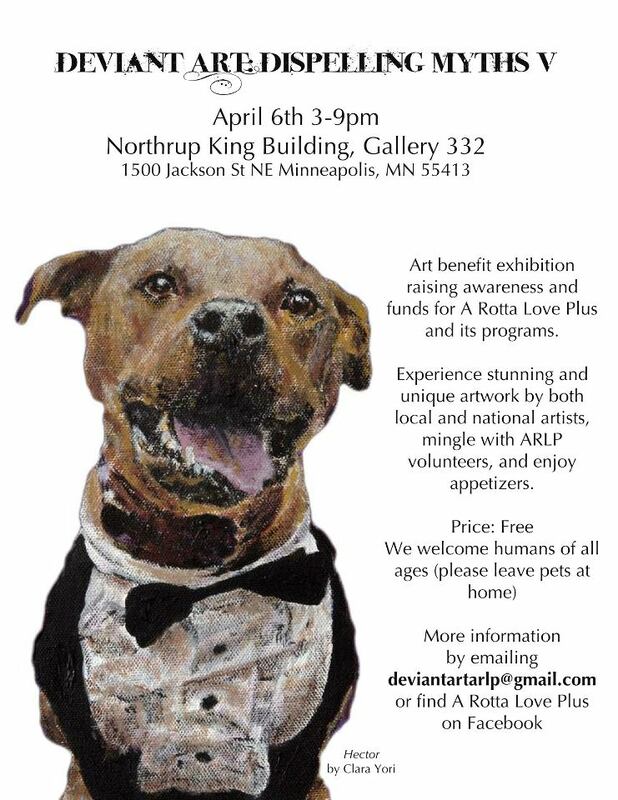 This show is a fundraiser for A Rotta Love Plus, a wonderful organization that rescues and rehomes rottweilers and pit bulls. They also work tirelessly to educate about dog safety and the problems associated with breed discrimination. 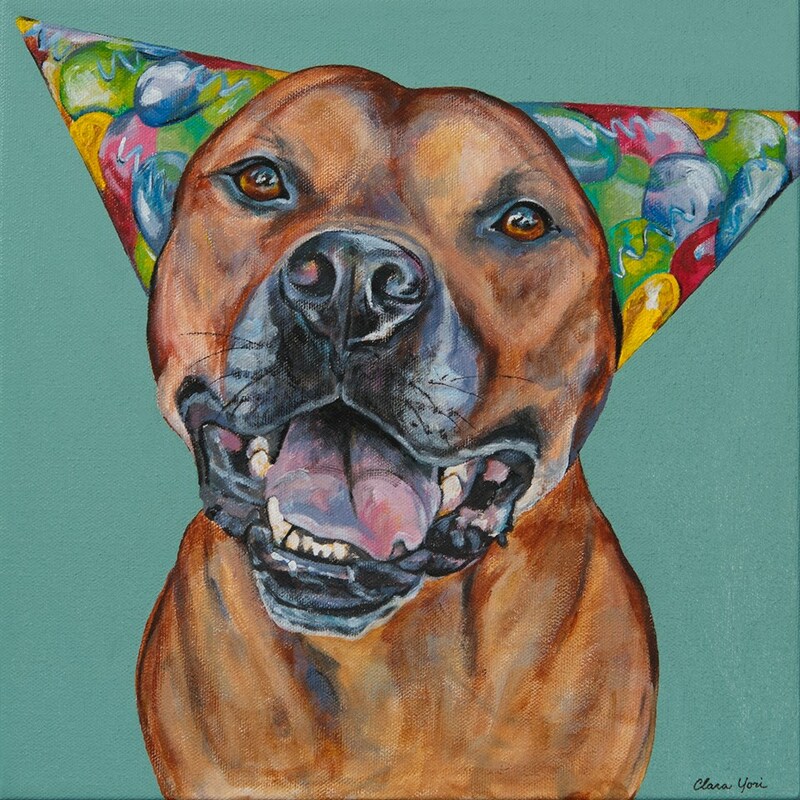 Please join me on Saturday, April 6th to celebrate the dogs and the art inspired by them. Special guests at the event will be our own two pit bulls, Wallace and Hector. Many thanks to Sarah of Lintu Art and the volunteers of A Rotta Love Plus for organizing the event. You can see the five pieces that I will have for sale at the event here.